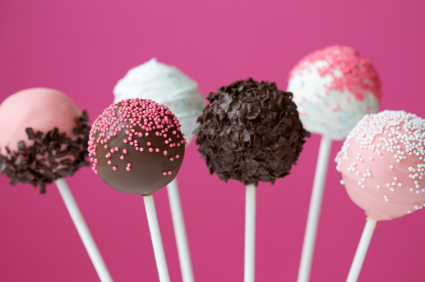 It’s National Cake Pop Day and one of my favorite “cake on a stick” treats is a dressed up in sprinkles brownie pop! Brownie pops are perfect for any casual party or celebration, especially with guests who are kids or adults who want something sweet in portion-controlled bites. The brownie pop makes it easy to enjoy a bite of a great dessert that satisfies the sweet tooth. Dipped in chocolate and decorated with sprinkles, they are irresistible for kids and adults! Preheat your oven to 350° F. Lightly grease an 8-inch square baking pan and set aside. In a saucepan, combine 1/2 cup butter and 2 ounces of baking chocolate. Cook over medium heat, stirring constantly until melted. Remove from heat and set aside to cool slightly. In a medium bowl, whisk together the granulated sugar, flour and salt. Pour in the almond bark mixture, and add the eggs and vanilla. Mix well. Spread the batter evenly in the prepared baking pan. Bake for 22 minutes, or until the brownies begin to pull away from the sides of the pan. Cool pan completely, preferably on a wire rack. Melt the remaining butter and baking chocolate in another saucepan over medium heat. Stir constantly until melted, and set aside. Crumble the cooled brownies into a large bowl. Add the chocolate-butter mixture and confectioners’ sugar and mix well. Shape 1-inch balls with the crumbled brownie mixture. Place them on a parchment paper-lined rimmed baking sheet. Cover with plastic wrap and refrigerate until firm (at least 2 hours, but you may also refrigerate overnight). Melt the almond bark according to package directions and keep warm. Remove one-third of the brownie balls from the refrigerator and insert the lollipop sticks. Dip the brownie balls into the melted almond bark coating. Swirl or tap off any excess. Press the coated brownie balls into your preferred decorations. I recommend using ramekins to hold each of the different decorations. At this point, you could also enlist the help of your birthday boy or girl to help with the decorating [yes, it’s that easy]. Place the coated brownie pops onto parchment paper and let stand until the coating is set. Repeat with the remaining brownie pops until done. You can make these brownie pops up to one day before your event, but refrigerate any items in an airtight container.